Synopsis: When Scott Carey begins to shrink because of exposure to a combination of radiation and insecticide, medical science is powerless to help him. 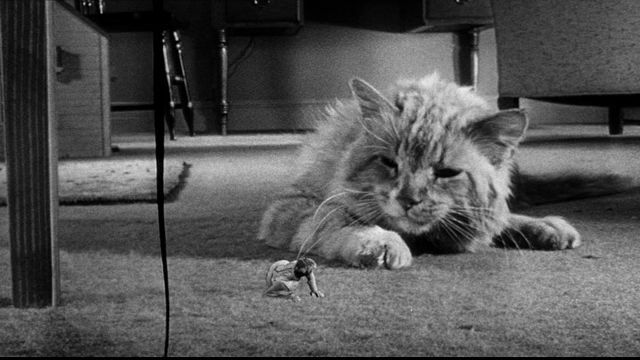 The Incredible Shrinking Man, Richard Matheson’s terrifying tale of a man’s unstoppable reduction in size, has its origins in a nondescript musical comedy called Let’s Do It Again, which was itself a remake of the 1937 movie The Awful Truth. There’s a scene in Let’s Do It Again in which Ray Milland mistakenly dons another man’s hat only to have it fall down over his ears. Matheson saw this movie and wondered what would happen if that hat hadn’t belonged to somebody else but had actually been Milland’s. From this seed of an idea, Matheson fashioned a compelling tale of gender anxiety which he then adapted for the screen in 1957. Scott Carey (Grant Williams) stands a little over six feet tall at the beginning of The Incredible Shrinking Man, but while enjoying a holiday at sea with his wife, Louise (Randy Stuart), Carey is engulfed in an atomic cloud while she’s below deck fetching him a beer. The incident is soon forgotten until about six months later when Carey realises that his clothes don’t fit properly anymore. Louise dismisses his concerns, suggesting that he’s just lost a little weight because he’s having a stressful time at work, but deep down Carey already suspects that something is wrong and asks her to buy a pair of scales. Carey grows even more concerned when he discovers that he’s actually growing shorter as well as losing weight, and that he’s now less than six feet tall. His doctor’s scepticism at this self-diagnosis is wiped away after a succession of x-rays taken of Carey’s chest over one week confirm that he is, indeed, growing smaller. The doctor refers him to the California Medical Research Institute, where a series of tests reveal that his body is shrinking because it’s losing ‘vital nutritional elements’. Together, Carey and Louise recall both the sea cloud from six months earlier and a more recent incident in which he was accidentally sprayed with pesticide. It appears that these two incidents have combined to cause some kind of chemical reaction inside Carey’s body. Over a period of months, Carey shrinks to the size of a small child, and it’s at this point that the movie’s special effects, which were no doubt entirely acceptable when the movie was released, remind us of just how old The Incredible Shrinking Man is. Today, a computer would no doubt be able to calculate exactly the dimensions of a five year old in relation to their surroundings and design an environment accordingly, but comparatively speaking, back in 1957 they were pretty much closing one eye while they held a thumb in the air with their tongue sticking out of the corner of their mouth. For this reason, the oversized props always look a little too large compared to the height Carey is supposed to be. Likewise, his dimensions just don’t look right when we see him in long shot opposite people of normal size. But the power of Jack Arnold’s movie lies not in its visual trickery but in the way that Carey reacts to his plight, and what it says about the fragility of a modern man’s self- esteem. Back in the 1950s there was even more pressure on a man to be the provider for his family than there is today. He was expected to be a figure of strength, and when that strength ebbs away a little more from him with each passing day, Carey is unable to cope. He becomes demanding and short-tempered with his wife and resentful of the world for the cruel curiosity it shows in him when he sells his story to raise cash after his diminishing size results in the loss of his job. An aspect which is explored in Matheson’s novel but barely hinted at in the movie is the sexual repercussions of Carey’s worsening conditions (although I haven’t read the book I believe it contains passages in which Carey spies on their teenage baby sitter and is mistaken for a child by a sexually predatory male), and had the times allowed it, an exploration of the inherent question of sexuality would have no doubt placed a mirror before the audience that would have made it squirm in discomfort. It’s perhaps significant that most variations on this movie’s story have been comedies that avoided the dark, inescapable questions any serious exploration of Carey’s plight would be compelled to explore if it was to retain credibility. Even a planned remake in the 2000s was proposed as a comedy vehicle for Eddie Murphy. 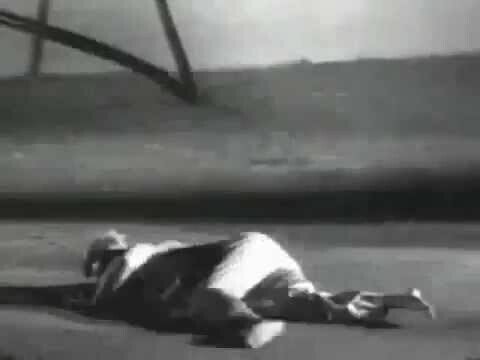 As it is, the closest The Incredible Shrinking Man comes to tackling the issue is the brief, but symbolically potent scene in which Carey’s wedding ring slips from his finger after he has suggested to Louise that she might want to bail. Things grow steadily worse for Carey with a horrible kind of inevitability. He has a brief but, we assume, platonic relationship with a fairground midget (April Kent) following a short respite during which the doctor’s believe they have halted the shrinking process. But when he begins shrinking again Carey is eventually reduced to living in a doll’s house, and it’s at this point that the psychological consequences of Carey’s condition are put on a back burner and his physical interaction with the world around him comes to the fore. Perspectives shift when Carey suddenly becomes prey for the cat that is the family pet. Carey has moved down the food chain. Fleeing from the cat, he hides behind the cellar door but is pushed down into the cellar when the cat pushes the door. Now Carey’s faced with an altogether different environment, one that’s less accommodating and even more hostile. Now he must hunt for his food instead of having it provided for him — and must avoid becoming dinner for some of the cellar’s other residents. He spies a stale piece of cake on a shelf which would be chest high to a normal person — ironically, it was left there by Carey’s wife when he informed her they’d found a possible cure for his condition — but which is almost unimaginably out of reach for Carey. But his new status invests Carey with a purpose, and he discovers a resourcefulness that previously lay dormant as he fashions crude climbing equipment out of needles and yarn in order to scale an upturned crate which, for him, has assumed the proportions of a tower block. It’s unusual to find an ending as downbeat as the one in The Incredible Shrinking Man, even though the structure of the story pretty much demands it. To have the shrinking process somehow reversed would be a cheat that would neither fit with the rest of the story or prove believable (despite this, Matheson wrote a sequel in which Carey’s wife shrank and was re-united with her husband before they both started to grow again. We can only be thankful that one was never made). After battling a tarantula spider — in a scene which is still as scary as hell today — Carey gains a fresh insight into his place in the world, and a new understanding that, no matter what his size, he will always count, he will always exist, even as he shrinks into a microscopic world that will no doubt be as alien as the stars in the night time sky upon which he gazes in the final scene.